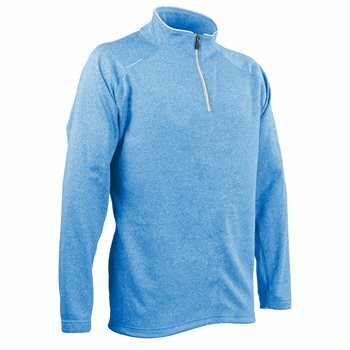 The Sun Mountain Heathered Fleece pullover features a tight knit, bulk free fleece outer face with a soft, brushed interior for warmth. The pullover offers significant 4-way stretch that provides comfort and allows natural range of motion. The Heathered Fleece pullover is designed with a zip-through collar with chin guard, a deep-cut zipper for easy on and off and a locking, YKK zipper pull.